Embraer’s new E195-E2 will be capable of flying between Sydney and Bali or Darwin to Bangkok after the manufacturer lifted the published range of the regional jet. In early June, Embraer said the E195-E2 would be capably of flying 2,600nm, an improvement from the previous figure of 2,450nm in 2016 when the company made changes to the wing and from 2,000nm at the launch of the E2 regional jet program in 2013. The improved range was based on the results of the flight test program so far. The maximum takeoff weight (MTOW) has also increased to 61,500kg, from 60,700 previously. By way of comparison, Bombardier’s CS100 has a range of 3,100nm. 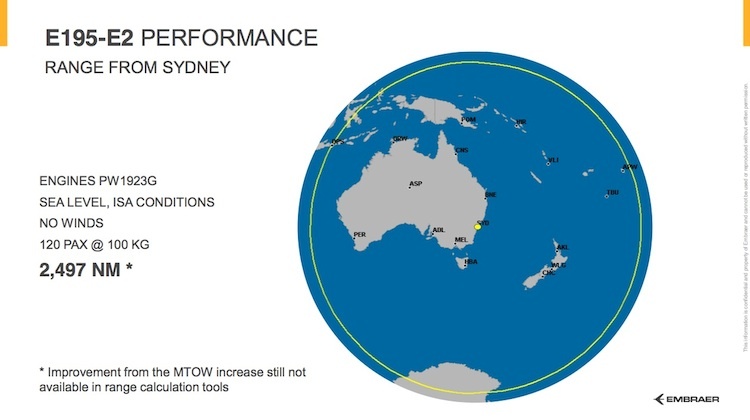 Range circles from Embraer provided to Australian Aviation showed the E195-E2 configured with 120 passengers would be able to fly between Sydney and Bali (2,495nm) or Sydney and Apia (2,336nm), based on certain assumptions. 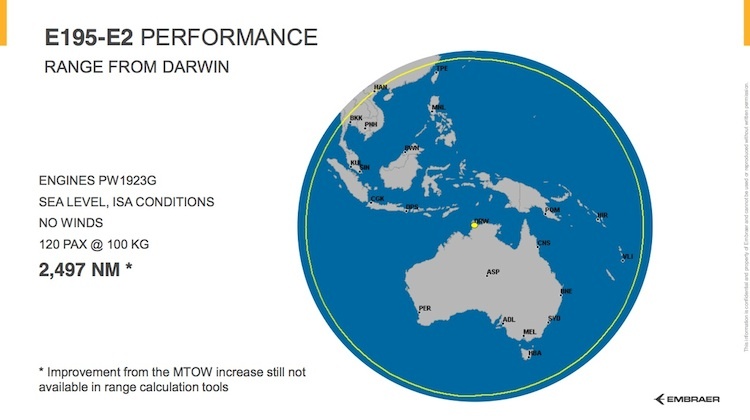 From Darwin, that puts destinations such as Bangkok (2,378nm), Hanoi (2,496nm) and Taipei (2,310nm) within range of the E195-E2, again based on certain assumptions. “We think Asia and Australia markets are markets where the E-jets can offer a huge role in a network both from a capacity and a range perspective,” Embraer Commercial Aviation chief commercial officer Arjan Meijer told Australian Aviation in an interview on the sidelines of the International Air Transport Association (IATA) annual general meeting in Cancun on June 6. 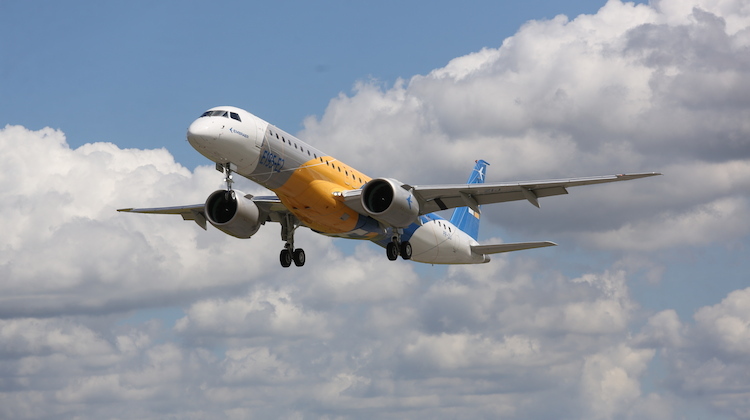 Similarly, Embraer said the E190-E2’s performance at so-called hot and high airports such as Denver, or short-field airports such as London City was expected to be better than initial estimates, based on the how the aircraft has been operating during flight test. There are three variants in the E2 family of aircraft – the E175-E2, which seats 80-90 passengers, the E190-E2 (97-114 passengers) and the E195-E2 (120- 144 passengers). They will be powered by Pratt & Whitney PW1700G and PW1900G geared turbofan engines. As of June 2017, Embraer had four E190-E2s and one E195-E2 in its flight test fleet. The first E190-E2 is expected to be delivered to launch customer Widerøe in the first half of 2018, while the E195-E2 entry-into-service was planned for the first half of 2019. Virgin Australia was removing all 18 of its current generation E190s by the end of calendar 2017. Thes jets would be ideal for services across the Tasman from places like Hobart, Canberra, Newcastle, Townsville etc. Virgin are making big mistake getting rid of their E190s! Hope someone like air north grabs them and starts these routes . Just because it has the range doesn’t mean the CASM is not too high to be competitive over these longer distances. VA’s E190s could fly routes such as CBR-BNE but the trip costs were not all that different from a 737 doing the same route and the CASM was much higher. The range numbers are all well and good but it is based on nil wind and ISA conditions. Now tell us the true range in typical airline operations including payload. Add the wind and I doubt it will be able to do these routes, had a 160knt headwind the other night on QF43 SYD-DPS. Don’t forget that Jetblue is trying to get rid of their e190’s as the maintenance costs are so high. How does the CS100 compare head to head? Especially in the cost sense. The range and fuel burn would have to be pretty good (at least on paper) for the Canadian machine. If the maintenance on the aircraft isn’t cost prohibitive and especially the engines. If it made sense financially, ostensibly VA could replace the E190, B737-700, A320 (the VARA ones… although it may work for TT too) and the F100 with a mix of CS100 and 300. QF the same with the F100 and B717 (and potentially the A320, although they are slated for NEO). It would be a marketing boon for whomever could deploy them in the west first, with the competition flying 20-30 year old 100 seaters! The E2 would be ideal for Darwin based operators for both Australian domestic and international operations. This aircraft and size would be ideal for Business hour daily return services between Sydney and Townsville or Gold Coast and Townsville or Newcastle to Sunshine Coast.